The P-26 was the US Army's first production low wing, all metal monoplane fighter. It was also Boeing's first monoplane Army fighter, having been better know for Naval fighters and Army bombers. It was also the last fighter to be successfully produced by Boeing until they bought out McDonnell/Douglas a few years ago. They now have the F-15E and F-18E/F which, designed by McD/D, now have 'Boeing' affixed to their designations. 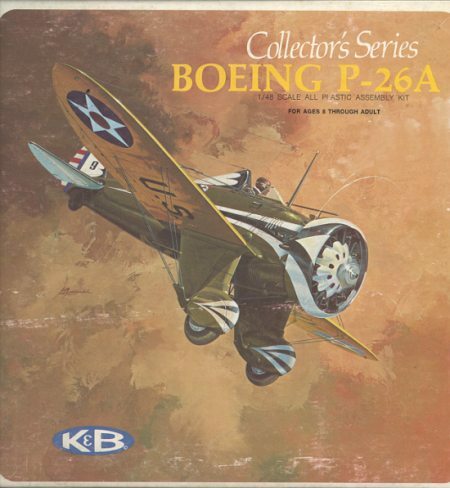 The P-26 wasn't that far removed from its biplane relatives. It was only a bit faster, not quite as maneuverable, and still festooned with all sorts of flying wires. However, it was an evolutionary step in the right direction and gave the Army Air Corps a relatively modern aircraft on which to hone the skills that would be needed a few short years later. Those of us who are 'model historians' will instantly recognize the origins of this kit. 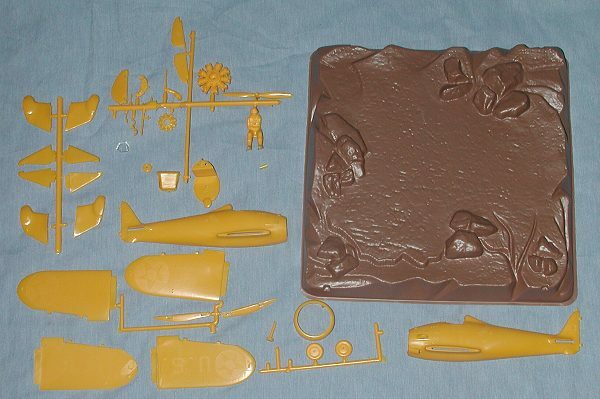 It is nothing more than a reboxing of the Aurora kit with the addition of a vacuformed base. Actually, the Aurora P-26 was pretty accurate and was a highly sought model until Hobbycraft brought out their even better kit in the early 1990s. The motto at Aurora was 'the more rivets, the more accuracy' and this one certainly fills that bill. However, it is not the golf balls that one finds on other kits of the period, but they are properly subdued. Naturally, all the panel line detail is raised, and you even get the benefit of having the placement for the decals proudly engraved on the kit. That is in case you wanted to paint the markings on, you know! However this engraving stops short of the scallops and flashes for the unit markings. Other details include a nicely done engine, a pilot figure (which is really needed as the cockpit is bare), and the required separate and moveable control surfaces. The vacuformed display base is strictly a K&B feature, its rough surface making me wonder how the plane would ever have gotten onto it in the first place! The instructions for the kit are well done and a combination of exploded view and written construction advice. All of the parts are named so you won't miss any. No painting information is given at all. What is given is the recommendation of "If it is desired to further decorate the model by painting, the Cover of the Box....may be used as a guide...". The decals that come with the kit are well printed and still look to be in great condition, despite the passage of time. 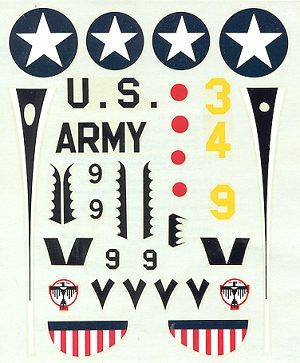 The modeler will have to paint all the white parts of the unit markings, but the black areas are provided as decals. I'm thinking the markings are for the 34th FS at March Field. As you might think, this is more a kit for the collector or those waxing nostalgic for their youth than for the 'serious' modeler. However, I can tell you that it can be built by a modeler of any skill level. After all, it is with this type of kit that I honed my early skills.